Woman to Woman: Is Your Heart Overwhelmed? I don't know if your heart is feeling overwhelmed right now. If not right now, it may have been overwhelmed in the past, or maybe a season of overwhelm is in your future. Right now, I'm enjoying a lull between seasons of overwhelm. However, I've experienced many seasons of heart overwhelm, and I understand what it feels like to be in heart survival mode. If your heart is hurting today, take comfort in the verses surrounding the phrase mentioned above. for my heart is overwhelmed. for you are my safe refuge. For you have heard my vows, O God. reserved for those who fear your name. 1. Cry out to God. He is ready and waiting to hear your heart's cry. You can be honest with him even in your overwhelm. 2. God is your help. When I feel overwhelmed, I often turn to the wrong things for comfort. Chocolate, books, and social media are my go-to's. Yet God promises to be our help and safe place when we feel overwhelmed. When I spend time alone with him, I feel greater peace and my cravings for those worldly pleasures diminish. 3. Your enemies can't reach you in God's presence. Often our hearts feel overwhelmed because someone or something else is causing trouble. Sometimes we don't ask for it; trouble just arrives. That's just the way life is. However, when we get alone with God, he perfectly comforts us and reminds us that he is in control over the forces that oppose us. You can meditate on God's transcendence and sovereignty, thanking him for his power, even in your season of overwhelm. 4. God's church is your sanctuary of peace. 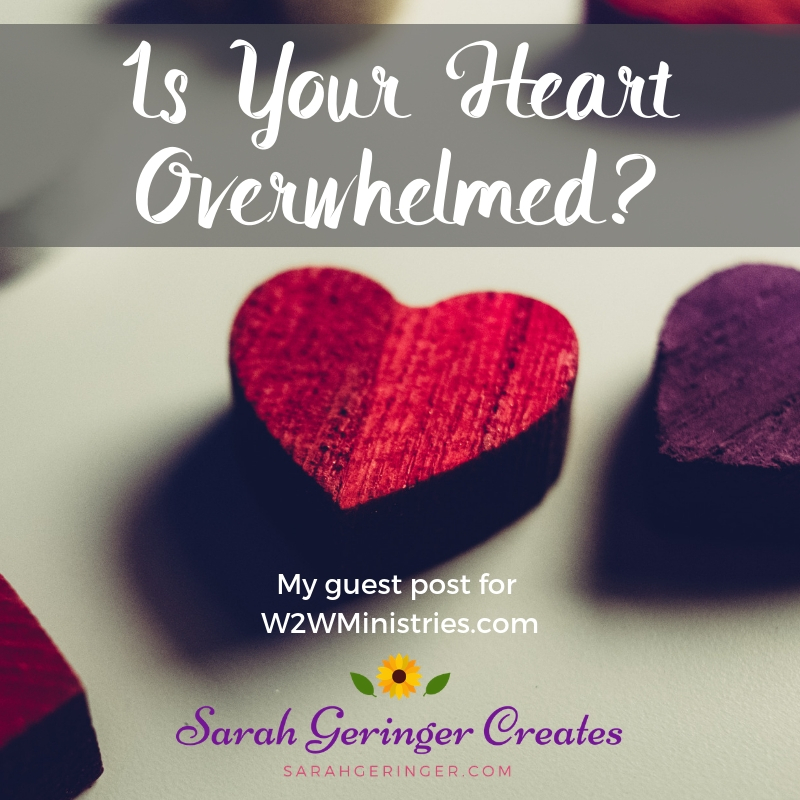 This morning I reflected on a recent season of total overwhelm and fear. I turned to a trusted group of Christian sisters to pray for me, and their prayers carried me through that tough time. We need each other's encouragement and help during seasons of overwhelm. Don't hesitate to ask your Christian friends to pray or otherwise assist you...they will be blessed while they are serving you. Also, don't neglect meeting in fellowship with other Christians, especially when you are struggling. The church can cover you in prayer and help you in ways you can't do yourself, friend. 5. God promises an inheritance that far surpasses our struggles.When I'm feeling overwhelmed, I withdraw to my hiding place and God reminds me that none of my struggles will last forever. If you have trusted Jesus as your Savior and Lord, you have the promise of heaven and new life too, friend. Don't let your troubles steal your hope and joy away. Keep your focus on God's promises, and you'll get through your season of heart overwhelm with greater peace. 1. In what season do you feel most overwhelmed? 2. Where do you turn to find peace when you are overwhelmed? My heart has been very overwhelmed in the past ten months, and in that very rough season the Lord has taught me so much. I have struggled with bringing everything to Him in the midst of exhaustion and weariness, but He has shown me once again He knows me better than I know myself. I am finding peace as I learn to linger in His presence. I am not good at lingering, so the key word here is "learn." Thank you for sharing this beautiful, encouraging Psalm and the comforting takeaways! Wonderful encouragement for my morning!! It's always good to be reminded that our overwhelm can rest in the hands of God. We all have those times when we feel a heaviness from a situation and I'm so thankful to have a church family that stands with me in prayer, this was a good reminder that I needed to praise Jesus for leading me to my church home. Thanks for encouragement today!! During times of grief I often feel overwhelmed to the point of speechlessness -- not knowing what to say to God. Thankfully, I'm always assured that He loves me still (and especially then) even when my words fail me. And you're right, those times never last forever.